Please visit Covering TeamCity for updated information. Measure your test quality and your team's progress by taking advantage of NCover's advanced code coverage features within TeamCity 6. 15 minutes, installation of Team City 6 (TC6), a .NET build framework (e.g., NAnt or MSBuild). Note that this document provides only a setup tutorial for NCover with TC6, not a comprehensive setup for TeamCity. A full TeamCity configuration tutorial can be found on the TeamCity website. This document follows the Project Setup > Build Template Setup flow in TC6. Please keep in mind that automatic display of NCover reports in TC6 only works when using TeamCity's built-in NUnit test runner. If you're using a different test framework, you should see the section on setting up NCover as a task of your build script rather than TC6 in order to import and view your coverage results. Install TeamCity 6 on the machine (instructions here). Set the build runner to NAnt and provide a build file path. Set the .NET coverage tool to NCover 3.x. Set the. NET runtime fields to the values appropriate for your configuration. Supply the path to the NCover 3 NCover.Console.exe executable. The %system.ncover.v3.x86.path% (or %system.ncover.v3.x64.path% when testing 64-bit applications) refers to the auto-detected path for NCover 3 on the build agent. Alternatively, you can provide the specific path, typically "C:\Program Files\NCover\NCover.Console.exe" (or "C:\Program Files (x86)\NCover\NCover.Console.exe for 32-bit NCover on a 64-bit system). Supply any NCover.Console and NCover.Reporting arguments. Click the highlighted text that first appears to reveal a default argument demonstrating syntax. For a complete list of NCover.Console arguments, refer to the NCover.Console documentation. For NCover.Reporting arguments, see the NCover.Reporting documentation. Click "Save" at the bottom of the page. Settings will appear when the window refreshes (see image below). Your project is configured to collect coverage. Set the build runner option to MSBuild and provide a build file path. Set the MSBuild version. NCover supports all the. NET frameworks, including 4.0. Mono is not currently supported by NCover. Optional: Enter the name of the build target you would like to use. The default build target for your build will be executed if none is specified. Based on the. NET runtime version you're using, select the appropriate MSBuild tools version & run platform (x86 or x64). Set the .NET coverage tool to NCover 3. x. Set the .NET Runtime fields to the values appropriate for your configuration. Supply the path to the NCover 3 NCover.Console.exe executable. The %system. ncover. v3. x86. path% (or %system. ncover. v3. x64. path% when testing 64-bit applications) variable refers to the auto-detected path for NCover 3 on the build agent. Alternatively, you can provide the full path, typically "C: \Program Files\NCover\NCover.Console.exe" ("C: \Program Files (x86) \NCover\NCover.Console.exe" for 32-bit NCover on 64-bit systems). Note: The NCover arguments should not include a call to run NCover (e. g., "path to NCover\NCover.console.exe"). TeamCity automatically provides that command when the NCover3.x selection is made for .NET coverage. When using TeamCity's built-in NUnit runner for your test framework, displaying coverage is already handled through the TeamCity GUI setup. If you are using a different test configuration, however, you must run NCover.Console.exe from a build script using TeamCity's service messages to pass your coverage file to TeamCity. (Service messages are output calls from your build script and of a form unique to that build agent. See more here.) TeamCity will then invoke NCover.Reporting.exe (also through service messages) and publish your coverage to their interface. 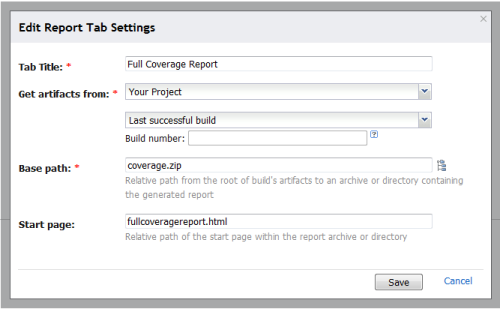 coverageFile="PATH FOR YOUR COVERAGE XML FILE"
testRunnerArgs="PATH TO TEST PROJECT DLL AND OTHER ARGUMENTS LIKE /NOLOGO /NOSHADOW"
There are two ways to view NCover coverage reports in TeamCity: at the Project level and the Build level. You can create custom report tabs at the Project level and specify the NCover reports you want to display. The full coverage report links to many other available reports, but you can specify any of the reports listed on the Code Coverage tab as the start page. Currently (TeamCity 6.5.3), TeamCity is configured for its code coverage tab to expect a file called "index.html" to be in the "coverage.zip" build artifact. You can modify this "expectation" in Administration > Server Configuration > Report Tabs. You can also edit the main-config.xml file directly. If you change "index.html" to "fullcoveragereport.html" to match the NCover root report name, then you get a more useful default report view.